Meet Scott Salkin of Allbound, an experimentalist switching from an agency to a software company. You can say Scott has been around the marketing block, from an agency owner to a start-up software founder who recently acquired funding. 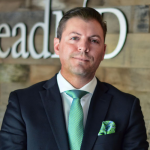 Allbound is right in our Silicon Desert backyard, so we invited him over to LeadMD Central to chat. Allbound originally started as an agency before switching to a software company less than a year ago after everyone and their moms were sitting in a coffee shop trying to develop agencies of their own. Salkin also drops facts and other key takeaways regarding channel marketing, an area that doesn’t always get the spotlight it deserves. Things are never as hard as they seem. Scott gives some easy and helpful suggestions. To Scott, that’s a recipe for failure. Content Focus on the content. Who is being marketed to? Is it reaching them effectively? Collaboration The team needs to work together. Everyone should be on the same page. Customer The customer is sometimes forgotten after the transaction. It’s important to follow up. Culture. The above C’s need to be synthesized together to form a cohesive community. Putting them into effect produces a culture of success. According to Scott, even the most advanced tech is useless if not taught properly or personalized for the user. To find out more, watch the video! What’s your experience with channel marketing been? Like or dislike? Start a conversation in the comments, or hit us up on Twitter. We’d be stoked to hear from you!